Kevin D. Phelan, Ph.D., co-director of the Division of Clinical Anatomy, shows incoming second-year medical student Sarah Beckwith the division's new Sectra Table, which allows students to explore human anatomy using 3D virtual technology. Aug. 1, 2018 | Aug. 1, 2018 | The University of Arkansas for Medical Sciences (UAMS) has acquired a 4K-resolution virtual dissection table that allows students to explore human anatomy in 3D with simple gestures common on the average smartphone. Students can swipe, scroll and zoom to rotate images in 3D, explore inside the human body, swipe off sections with a virtual “knife” and touch to remove layers or organs so they can explore deeper inside the body. 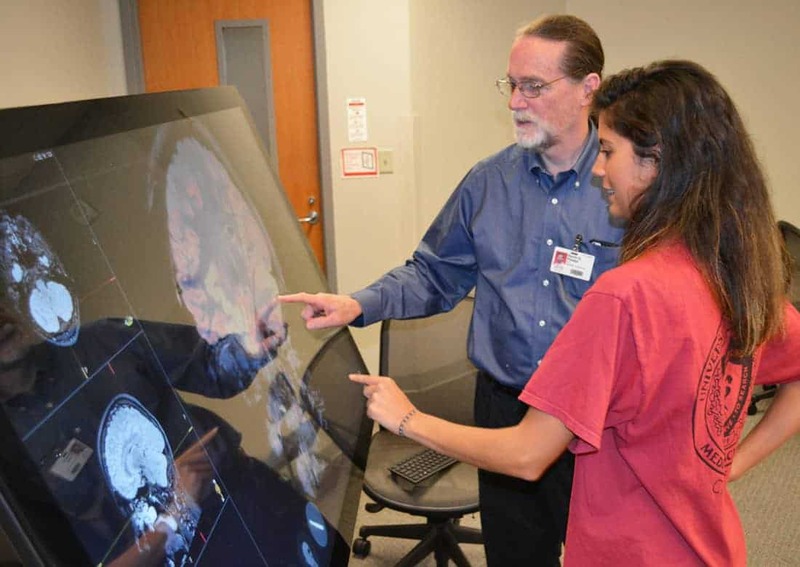 Digital archives from UAMS and the wider public give students access to cases, where they might see the effects of a specific condition or treatment. They can learn to read different types of scans — like CT, MRI, X-ray and ultrasound — or practice their skills with microscopy. David L. Davies, Ph.D., (left) and Kevin D. Phelan, Ph.D., co-direct the Division of Clinical Anatomy. UAMS’ Sectra Table was one of the first 4K resolution models delivered in the United States and is the only in Arkansas. The $90,000 table is part of a $1.3 million renovation this summer to the College of Medicine’s anatomy lab. The technology is cloud-based, so students can gather around the table to explore it in small groups or send images into lecture hall displays for large-group discussions. The table has been used with some of UAMS’ summer programs for students of all ages who are interested in the medical sciences. In the fall, medical students, residents, nursing students, physician assistants, radiology students and others will encounter it as part of the curriculum and have access to it 24/7 for independent study in the College of Medicine gross anatomy laboratory. Kevin D. Phelan, Ph.D., co-director of the Division of Clinical Anatomy, said that often students struggle to understand the 3D relationships between parts of the body, even if they have performed a dissection or seen many 2D diagrams. “Tools like these can be a powerful way for students to visualize human anatomy and really orient themselves with the kind of expertise they will need,” Phelan said. Davies said it is also incredibly important for students to learn to interact with technology.